Chris King's First TV Ad Slams Politicians Who Accept Sugar Money. How Do Candidates Stack Up? 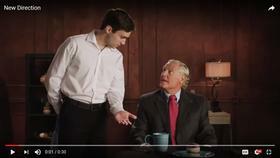 Democratic gubernatorial candidate Chris King has entered the television ad market. King went after Florida’s politicians whose committees accept millions from the sugar industry. In King’s first crack at a television ad, a nameless politician has his cup run over with sugar being poured by a butler. Then, King makes a promise. "I’m Chris King, and I won’t take a dime from them," King asserts in the 30-second commercial. U.S. Sugar is headquartered in Clewiston, Florida, and produces a tenth of the nation’s sugar. It has a sizable hand in state politics, and has donated well over a quarter of a million dollars to Agriculture Commissioner Adam Putnam’s political action committee Grow Florida. Kimberly Mitchell is director for the Everglades Trust, the political watchdog arm of the Everglades Foundation for environmental research. She spoke with WFSU about King's commercial, and how other candidates vying for the Governor's Mansion stack up when it comes to accepting sugar money. "Political contributions are not, are not inherently bad," Michell said. The problem, Mitchell says, is big sugar is in the business of sugar subsidies as well as growing sugarcane. Mitchell says King was the first of the gubernatorial candidates to step forward with a principled stance, when he was little-known. Others, in both parties, have followed suit. "There’s one candidate for governor, Ron DeSantis, who has absolutely pushed back against the sugar subsidy program," Mitchell said. Then there’s Gwen Graham, who donated the less than $20,000 in sugar money she received to a nonprofit working for estuary recovery. "Gwen Graham, as an example, she intuitively understood and just historically understood, the damage that the political stranglehold and the environmental stranglehold was having on our state," Mitchell said. Mitchell adds Miami Beach mayor Philip Levine, like King, has sworn off sugar money. She says her organization has had positive talks with Tallahassee Mayor Andrew Gillum, but says Gillum has not given what she calls a “full-throated” commitment.